Yancey Richardson is pleased to present Tori, the gallery’s sixth exhibition by Japanese artist Masao Yamamoto. The works included in Tori, the Japanese word for “bird”, span the breadth of Yamamoto’s career, from 1994 to the present and include both photographs printed by the artist and hanging scrolls. A subject of lifelong interest, with Tori Yamamoto seeks to capture the essence of birds, while remarking on the visceral connection and similarities between these creatures and humanity. Ranging from a pigeon contemplating its reflection in a pool of glassy water to a solitary eagle flying high above the Mongolian mountains, Yamamoto’s birds suggest the fragility, beauty and ultimate mortality of all life. Intimately scaled and masterfully printed, Yamamoto’s toned photographs bear evidence of the artist’s hand where he has torn the paper, applied flecks of gold paint, or dashes of red and blue ink. Yamamoto’s newest works include Kakejiku, a traditional Japanese hanging scroll. Printed on handmade Gampi paper, the photographs have been mounted onto a scroll using classical techniques and materials such as kimono silk, Washi paper and wheat starch paste. In conjunction with the exhibition, Radius Books has released Yamamoto’s 10th book, also titled Tori. The monograph combines photographs carefully sequenced by the artist with a selection of poems by Wallace Stevens, Seamus Heaney, Emily Dickinson, William Carlos Williams and others. 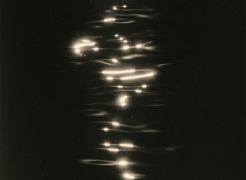 Yamamoto’s photographs and installations have been exhibited internationally at the Centro per l’Arte Contemporanea, Rome, the Tokyo Metropolitan Museum of Photography, the Galeria d’Arte Moderna di Bologna, the Maison Européenne de la Photographie, the High Museum, Atlanta, and the Museum of Fine Arts, Houston. The work of Masao Yamamoto is held in many major museum collections including the Harvard University Art Museums, the Museum of Contemporary Photography, Chicago, the Philadelphia Museum of Art, the Museum of Fine Arts, Houston, The International Center of Photography, the Center for Creative Photography, Tucson, the Princeton University Art Museum and the Santa Barbara Museum of Art.